Today when I picked up my son at his house to take him to the doctor, he was very excited to tell me about things he had learned. Unfortunately, he doesn’t understand what it means or how scary the situation is – to him it’s exciting news because someone he knows was on TV. Malika lived in my son’s supportive community – “Malika moved” “Malika on TV” “Malika lost” was the news that he told me. A 17-year-old mentally disabled girl who ran away from a Bonney Lake-area group home Sunday was found safe this morning, according to the Pierce County Sheriff’s Office. Auburn police found Maliika Andrus at a Starbucks coffee shop after a witness reported seeing her. She was taken to a local hospital for evaluation and will be returned to the group home later today. Washington State passed a harmful law in 2011 which prohibits “youth” 21 and under from admission to the supportive community of our state’s Residential Habilitation Centers (RHCs). They may be allowed short term admission in crisis situations if no other alternatives are available. The only alternative is the new 3-bed crisis stabilization unit – that is hardly sufficient to safely care for our youth. Malika was most likely admitted on a short term stay and that had expired. Our state had to evict her from the safe community to a group home. Alarms are not nearly as safe as alert human eyes and presence. This law puts all our youth with disabilities and their families at risk. We need to overturn this law to help prevent harm to our loved ones. Wow – summer finally started in the Seattle area today. I was at my son’s supportive community and they decided to pull out the sno-cone maker machine – talk about bees swarming to honey! This treat was much appreciated by all and the campus was buzzing with activity. This is what true community is about – being able to participate and have fun with your neighbors! Even with the lure of sno-cones, the residents who garden with me were excited to pick the first of our snap peas – they are like candy to some of us. The tomatoes and corn were planted, too. The gardens will be in full swing very soon! Our blueberry bushes are amazingly abundant with berries – can’t wait until it’s time to pick them. Look at this photo that was taken last week after a rainfall. The bush can barely hold itself up due to the weight of the berries! Sylvia Fuerstenburg, Executive Director of The Arc of King County, has again written an essay regarding the advocacy of The Arc for people against the right to live in supportive communities. I just cannot wrap my brain around how an advocacy group, which receives thousands of dollars of public funds each year, is allowed to openly discriminate against a segment of the population which they are PAID to advocate for. They clearly do not understand the situations of those who have homes in supportive communities and do not seem to realize that moving many of these people from their chosen communities and homes will only increase the crisis to the community as a whole. Below is my letter to Ms. Fuerstenburg and Mr. Lance Morehouse, the Outreach and Advocacy Coordinator for King County Parent Coalition: Please send your comments also. I do not think that my comment will be published given past history of The Arc blocking critical information for families regarding supportive communities. but I keep trying to get through. I would appreciate the opportunity to make a comment regarding your letter in the December Newsletter. I do hope that my comments will be available for all to read and discuss. I wholly support the mission of The Arc to advocate for people to live in the community of their choosing. “The Arc believes that all people, regardless of the severity of their disability, can live successfully in the community with individualized and appropriate supports.” I think that all advocates believe this – the problem is finding funding and maintaining a stable, qualified support staff as caregivers for those who need supports. Do you listen to the people in the community talk about the difficulty they have in finding even someone to provide a couple of hours of respite? Do you read about the very high staffing turnover of caregivers in community homes (up to 45% in some areas). Do you listen to families of people living in family homes about how many caregivers they interview and hire each year to help with caregiving in the home? Do you hear the parents who cannot work or who have lost their job because they have used too much “sick” time because they cannot get another caregiver? Do you hear the families who are bankrupt or struggling financially because they cannot get help caring for their child? Do you hear the families who use the ER or have to have their child admitted to the hospital for crisis care – the only “respite” those families receive? It does not appear that The Arc hears these voices – if you did, it would be negligent to increase capacity of this residential population, particularly of those who need high supports, which would then over-tax an already under-funded and under-staffed community residential service system. I have never heard that one is “too disabled to live in the community” from a person who advocates for a continuum of care, including living in a supportive community. You’re right, no one is “too disabled” but there are people who do require a team of support people to keep them safe and healthy. Sure, with unlimited funds, everyone could live in a residential neighborhood – but that is not the reality. Our funds are limited. As Lance said in the October 23, 2012 DD Task Force meeting, his son was able to live at home for 17 years with the help of 19 hours a day of licensed nursing care. I’m very happy that their family had this opportunity but this is not a cost effective system to manage a large number of people who may need this level of nursing and caretaking support. If all those in the supportive communities chose to live in a neighborhood residential home and required this high level of support to survive, would our state be able to financially handle that? I know it wouldn’t. So why then, does The Arc advocate for this type of residential service (which is clearly more expensive than a supportive community) and then say that those in the supportive community are taking more than their share? It should really be the opposite – our state should be thanking those who choose to share services, and thanking those who choose to live in a supportive community home for many reasons. These communities have a track record of having a more stable workforce and the fact that many services can be shared among residents is much more cost effective system for those with high support needs. These supportive communities are far from segregated – in fact, most of the residents who have homes in these communities are out shopping, going to school, participating in parks events, go to church, attend neighborhood and city functions and more. You just may not be aware of them because they have the support that they need to be out and about – unlike people locked away in their “community residential” home because a caregiver did not show up for work or the staff is untrained in behavior management and therefore unable to take the resident out of the house, or some other reason. Living in a supportive community allows one more freedom. Many of our citizens of all ages and types voluntarily choose to live in some sort of supportive community for various reasons. Why are our citizens with ID/D being denied this right to choose which community is best for them? Isn’t this discrimination against them due to their disability? Isn’t the Arc against that type of discrimination? Apparently not since The Arc advocates, and uses public funds, to do just that – discriminate against our most vulnerable. It’s time for a change – let people have the choice – true choice – give them the information, allow them to decide what is best for them. Is our state allowing clinical trials on our most vulnerable citizens without an ethical review? Human Subjects Research being done on our most vulnerable citizens with no consent or ethical review. Senator Adam Kline is proposing legislation, again, which is an experiment on our most vulnerable citizens. Why are we allowing this happen right under our noses and why aren’t more people calling him and others out on this unethical practice? The year 2011 saw passage of a bill which legislated age discrimination in violation of the US DD Act and the US Supreme Court Decision Olmstead by not allowing those 21 and under to receive the life saving and life sustaining services in the Residential habilitation Center (RHC). This bill also called for the closure of one of our state’s RHCs and froze admissions to another one. There was one negligent death just one year ago of an individual who was evicted from his RHC home into his “own” community home. He suffered needlessly due to incompetent and untrained caregivers before dying from swallowing laundry detergent which had been stored on the counter in a milk carton. Now, Senator Kline is again pushing our DD Service System Task force to run more experiments our most vulnerable. He is advocating for closure of another RHC (he states 360 people – which is the number of people who reside at Rainier School) in the quote below transcribed from the Task Force meeting on October 9, 2012. “You’ve got some number of families – of those 360, would want to have their loved on in a RHC, receiving the kind of care that they have and their choice is in “hither or yon” or in the community. The whole point of sub F (part of legislation that Senator Kline is trying to get passed)– take a look at it – is to guarantee as best we can – that the treatments – we spell it out – medical, nursing, dental, behavioral, mental, habilitation, employment, day support, that those, that the degree of applicability in the RHC is met in the community above and beyond what the residential provider provides. Given that Senator Kline is clearly talking about closing an RHC and he clearly states that community services will be more expensive. Yet, Senator Kline has idea what the number will be of those whose care will be more expensive in the community than in their current RHC home. This means that he will have to have a threshold of who will receive appropriate care and who will receive negligent care . 1. How many people will Senator Kline allow to have their assessed needed services in the community? 10%, 25%, 50% 75%? 2. What is the cut off for not having ones assessed needs met? 3. What happens to those who then fall on the other side of that cut off? 4. Do we accept negligent care for them because their care is now too expensive? Why would anyone consider moving people who are happy in their homes, not requesting to move and have their assessed services met in a cost effective system to an untested and most likely more expensive system? Isn’t this illogical and unethical? Well, this is exactly what Senator Adam Kline and others who are pushing for – an expensive and experimental system change. Where are the ethicists in this experiment? 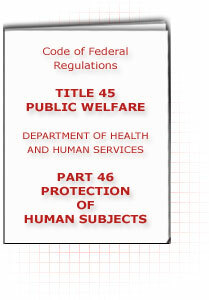 Look at the Code of Federal Regulations and ask about the protection of human subjects. Why are our legislator allowed to play experiments on our loved ones without an ethical review team looking into this. Please look at the Nuremberg Code, the Helsinki Agreement and the Belmont Report (A Guide to Research Ethics, 2003) below and tell me why these experiments are even being talking about without going through an ethical review. I am writing with concerns that I and many others have regarding government accountability. Much of this has stemmed from the passage of 2SSB5459 last year and the more that I research and uncover through public disclosure, the more I am frustrated by the lack of integrity and accountability that some of our state’s agencies and legislators allow. I am referring to issues regarding care of our most vulnerable citizens. The Department of Social and Health Services (DSHS), The Division of Developmental Disabilities (DDD), The Developmental Disabilities Council (DDC), Disability Rights Washington (DRW) and The Arc Chapters – which actually have a monopoly on almost all social media and groups that have issues pertaining to people with developmental and intellectual disabilities – all have an agenda which they push and utilize false, incomplete and inaccurate data and reports as “facts” in order to gain agreement with their agenda from others. Logically, I could not see how what they were saying could in fact be true and I started to do my own investigation of data and reports. I have gathered much information through public disclosure and by looking at the original sources; it is clearly evident that the above mentioned agencies are choosing not to look at the data accurately. Any attempt to have accurate data shared is censored and people are not aware of the inconsistencies and inaccuracies that those agencies promote. Due to the inaccurate reports that the above agencies are using, our legislators are making critical decisions that are not based on the accurate data. Many people are being hurt by these decisions and in fact we have already had one death this year solely due to the passage of 2SSB5459. It is time to stop and take a look at the practices of these agencies and question why they are promoting policies that actually hurt the very people who they are set up to protect. I have contacted Washington State Institute for Public Policy (WSIPP) regarding some of these issues also. The author of the last report which WSIPP published responded to me that yes, I indeed did have some critical information that needed to be considered but they are only able to do research if directed by the legislature. The problem is that so many of our legislators listen to the above stated agencies’ as the experts and will follow their instruction and recommendation when in fact that is part of the problem. We need to have an outside entity look into these issues – an independent group which can look at the facts without needing to support an ideology. I have attempted to do this with research but since I am only one person and am reporting information which does not necessarily support the approved ideology, I am censored and silenced. It is extremely difficult to have people look at this information since this issue has gone on for so long and people are most likely sick of it being repeated. I can tell you from looking at this issue without the ideology one will see a very different picture than the picture painted by the “experts”. Looking at the budget figures alone, the support needs of the residents (as reported by the individual residential agencies themselves) and taking information from DDD and DSHS reports, it is clear that there is a continuum of support needs and as a person has increasing needs, their cost of care for direct and indirect support needs increases. The place of residence does not affect the cost of direct care. The report referenced above is a perfect example of manipulating the data to fit the ideology even though the data collected in the research did not support the ideology. The data was collected for three different residential settings: Residential Habilitation Centers, Community Residential and Other Community Residential. The data clearly showed statistically significant differences in supports needs between residents in all 3 settings. The author of this report chose to collapse the three settings into two for the “Key Findings” and proceeded to state “Residential Habilitation Centers and Community Residential” and “Other Community Residential” were the two settings. This manipulation totally changes the outcome of the data and this was done in order to support a particular ideology which the data itself did not support. There are other issues regarding how 2SSB5459 was passed into law. There was a public hearing (with only 20 minutes notice) May 18, 2011. Rule 45 was suspended for this meeting so that bills could be heard without 5 days’ notice. I do not see any written notes regarding the reason for this rules suspension. This public hearing was to be on SSB5459 yet as the public meeting was commencing (again with only 20 minutes’ notice) it was stated that there was now a new substitute bill that was just at that moment going into the Electronic Bill Book. How can there be public testimony on a bill that is not even available yet? Also, it states in the bill history that the First Reading of 2SSB5459 was on May 19, 2011 – the day after the public hearing. Why is the path of 2SSB 5459 allowed to take this very unusual and undemocratic route to passage of this bill? I have much more information regarding costs, health and safety, quality of care and support needs. I would welcome the opportunity to be able to share this information with people in hopes that some of the decisions that have been made based on information only supporting one ideology can be looked at with a more objective perspective. Please contact me for information regarding costs reported by agencies, DDD Reimbursements to agencies, Support Needs Index of Residents and cost shifting. Please Ask DSHS and DDD These Questions! This letter was sent to all Washington State Legislators and many other advocates. I do hope that these questions are asked and that answers are received. The Department of Social and Health Services and the Division of Developmental Disabilities NEED to answer these questions and more. The data that they continually present to our legislators is flawed and incomplete and doesn’t tell the whole story as it needs to be told in order to make policy decisions. This proposal is thoroughly lacking in sound judgement. 1. To close this facility will cost our state millions of dollars – the data that these decisions have been made on have been missing many cost areas and are wholly inaccurate. Please take a look at the charts here residential Cost Charts for a much more realistic view of the actual costs. Bear in mind that even these costs do not take into account several critical areas of cost: Food, Medical and Habilitation. 2. Aside from the issue of cost – What about the PEOPLE? Are we not here to help care for others? Take a look at this essay which illustrates how we recently cared for one of our most vulnerable citizens Risks outweigh Benefits. Is this what we want to replicate with moving residents from their safe, stable homes at Rainier? 3. This IS NOT THE ANSWER – LEAVE OUR STATE OPERATED RESIDENTIAL FACILITIES ALONE – THEY ARE THE BACKBONE AND SAFETY NET OF CARE!